The first HST servicing mission had three primary objectives: restoring the planned scientific capabilities; restoring reliability of HST's systems; and validating the HST on-orbit servicing concept. The most distinctive feature of the mission was the large number of critical operations to be carried out in space. Considerable allowance therefore has to be made for the unforeseen. The mission schedule was planned with this in mind, seeking to maximise the chances of success while retaining the flexibility needed in order to react to circumstances as they arise. 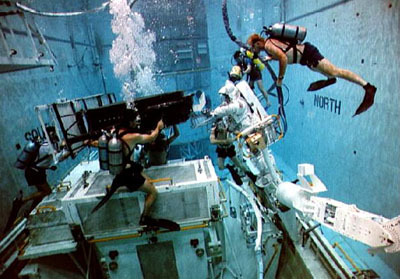 The astronauts themselves underwent intensive underwater training, at the space centres in Houston, Texas, and Huntsville, Alabama. To minimally satisfy the mission's overall objectives, astronauts needed to replace one gyroscope pair (either pair #2 or pair #3) and install either an operational Wide Field/Planetary Camera II or the Corrective Optics Space Telescope Axial Replacement (COSTAR), the other corrective optics package on the STS-61 manifest. Before launch, a completely successful mission was defined as replacement of gyro pairs #2 and #3, both optics packages, the solar arrays, the magnetometer, and the solar array drive elec-tronics. 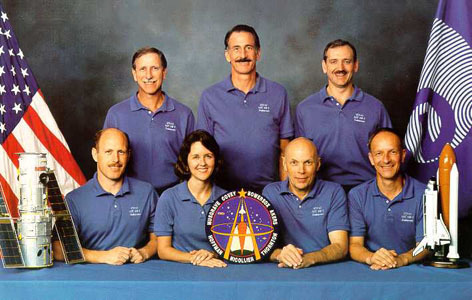 In fact, the STS-61 crew accomplished all of these tasks plus all all lesser priority items such as the Goddard High Resolution Spectrometer Redundancy Kit, the DF-224 coprocessor, a second magneto-meter, fuse plugs for the gyros, and an electronic control unit for gyro pair #1 and an HST reboost. December 2, 1993 4:26am. Endeavour was switched from Pad 39A to Pad 39B on Nov.15 due to contamination of the Payload Changeout Room after a windstorm on Oct.30. On Nov.18 Endeavour experienced a failure of a delta-p transducer on the elevon hydraulic actuator. To change out the actuator, would require a rollback to the OPF because access to the actuator is only thru the Main Landing Gear (MLG) wheel well. Since there are 4 delta-P transducers and the LCC (Launch Commit Criteria) requires only 3 of 4, the transducer was depinned and will not be consulted during flight. 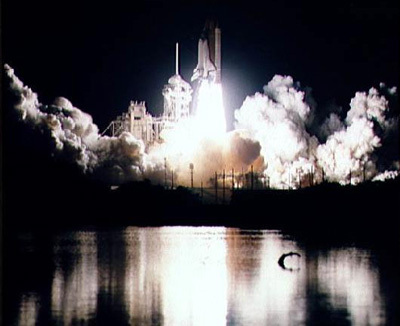 Launch attempt on Dec.1 was scrubbed due to weather constraint violations at the Shuttle Landing Facility. Launch weight: 250,314 lbs. Payload Weight up: 17,662 lbs. 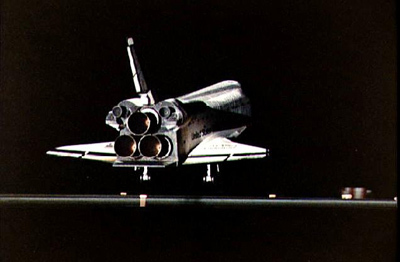 December 13, 1993 at 12:26.25 am EST KSC Runway 33. Both Endeavour and it's crew are in excellent shape. Landing Weight: 211,210 lbs. Payload Weight down: 17,662 lbs. Day 1 After launch, the astronauts carried out a series of checks on the vehicle and went to sleep seven and a half hours after liftoff. Day 2 The crew made a detailed inspection of the payload and checked out both the robot arm and the spacesuits. Cabin pressure was dropped 45% in preparation for the spacewalks. 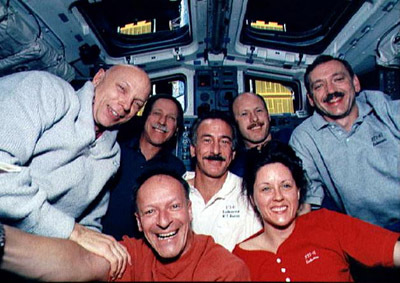 All systems functioned well as the crew got a full day's sleep in preparation for the evening's rendezvous. Day 3 Covey maneuvered Endeavour within 30 feet of the free-flying HST before Claude Nicollier used the robot arm to grapple the telescopeand to berth it in the shuttle's cargo bay. Additional visual inspections were performed using the camera mounted on the 50ft long shuttle remote manipulator arm. Musgrave and Hoffman started their 7 hours and 50 min. EVA by unpacking tools, safety tethers and work platforms. Hoffman then installed a foot restraint platform onto the end of the shuttle's remote manipulator arm which he then snapped into his feet. 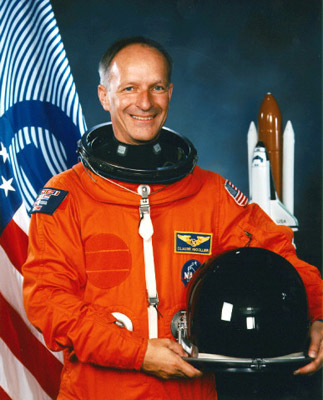 Claude Nicollier drove the arm from within the shuttle and moved Hoffman around the telescope. Musgrave installed protective covers on Hubbles aft low gain antenna and on exposed voltage bearing connector covers. The astronauts then opened the HST equipment bay doors and installed another foot restraint inside the telescope. Musgrave assisted Hoffman into the restraint and Hoffman proceeded to replace two sets of Remote Sensing Units. These units contain gyroscopes that help keep Hubble pointed in the right direction. After Hoffman had finished swapping out RSU-2 (containing Gryo's 2-3 & 2-4) he swapped out RSU-3 (containing Gryo's 3-5 & 3-6) and replaced a pair of electrical control units (ECU3 and ECU1) that control RSU's 3 and 1. The astronauts also changed out eight fuse plugs that protect the telescope's electrical circuits. Hubble now has a full set of six healthy gyroscopes. 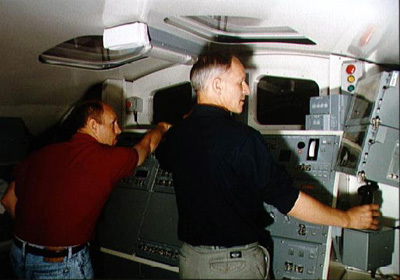 The astronauts struggled with the latches on the gyro door when 2 of 4 gyro door bolts did not reset after the astronauts installed two new gyro packages. Engineers who evaluated the situation speculated that when the doors were unlatched and opened, a temperature change might have caused them to expand or contract enough to keep the bolts from being reset. With the efforts of determined astronauts in Endeavour's payload bay and persistent engineers on the ground, all four bolts finally latched and locked after the two spacewalkers worked simultaneously at the top and bottom of the doors. Musgrave anchored himself at the bottom of the doors with a pay-load retention device which enabled him to use some body force against the doors. Hoffman, who was attached to the robot arm, worked at the top of the doors. The duo successfully latched the doors when they simultaneously latched the top and bottom latches. Day 5 Akers and Thornton replaced HST's solar arrays during their 6.5 hour EVA The pressure in Thornton's vent garment was .2 psi instead of the the normal 4-6 psi. This was due to a possible ice plug in the suits plumming which shortly melted. Thornton then topped off her suit. There were also other problems with Thornton's EVA suit. 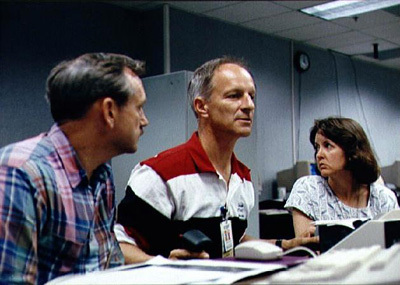 Her communications receiver malfunctioned in a way that allowed her to talk to Akers but not to Mission Control. The crew decided to use a technique of relaying all commands for Thornton via Akers instead of switch-ing to the backup comm channel. The backup channel is used for suit biomedical telemetry and would have limited Mission Control's ability to monitor that telemetry. 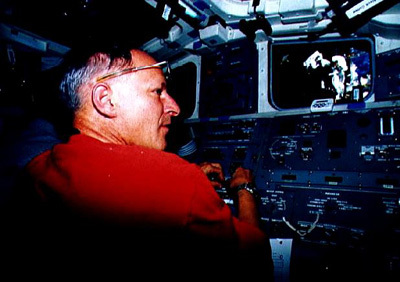 Akers started the EVA by disconnecting 3 electrical connectors and a clamp assembly on the solar array. He had a slight problem with the clamp assembly. Thornton held the array in place so that it would not drift freely after being detached. The solar arrays weigh 160 kg (352 lbs) and are 5 meters long when folded. 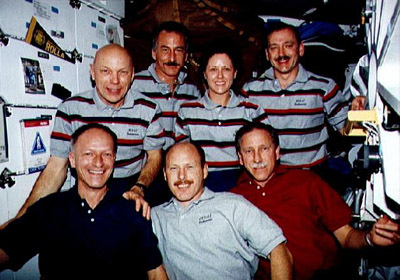 The astronauts dismounted the damaged array and Thornton held the array until the next daylight pass (approximately 12 min) before throwing it overboard. The release imparted a 1ft per second velocity to the arrays and then the orbiter did a small burn with the RCS that imparted an additional 4 ft/sec. The array, moving away from Endeavour at 5 ft/sec (3 miles/hr), will seperate about 11-12 miles each orbit. The crew then installed a new array and rotated the telescope 180 degrees.They then replaced the second solar array which was stowed away for return to ESA. Day 6 EVA # 3 lasted 6 hours and 47 min. 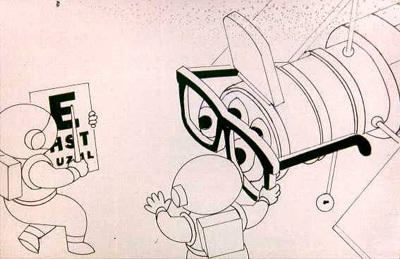 Hoffman installed guide studs on the Wide Field Planetary Camera (WFPC) and prepared the WFPC for removal while Musgrave setup a work platform and worked on opening an access door to allow observation of WFPC status lights. Hoffman attached the support handle to the WFPC and, with assistance by Claude Nicollier on the arm and a free floating F. Story Musgrave, removed the WFPC. The new 620 lb WFPC was then installed. 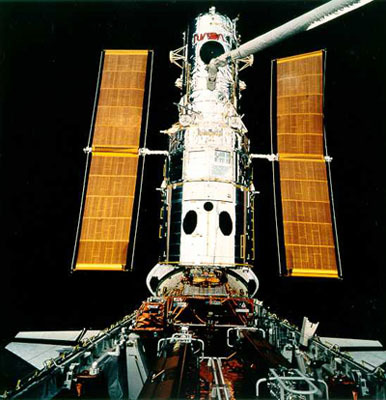 Following that, Hoffman changed out two magnetometers, located at the top of the telescope, which are the satellite's "compass". They enableing HST to find its orientation with respect to the Earth's magnetic field. Both original units were suffering from problems of background noise. During installation, 2 pieces pealed off the magnetometers and flight controllers are accessing any possible impacts. Day 7 In EVA # 4, Thornton and Akers replaced HST's High Speed Photometer (HSP) with a device called COSTAR. This acronym stands for the Corrective Optics Space Telescope Axial Replacement system and the unit corrects HST's sperical aberration of the main mirror for all instruments except the WFPC-II camera, which has it's own built in corrective optics. Shortly after partially opening the door, the astronauts practiced reclosing the door. The door exhibited the same reluctance upon closing that was experience on different doors during previous EVA's. The HSP was removed and then reinserted to practice for the COSTAR installation. HSP was then parked on the side of the payload bay while COSTAR was removed from stowage and successfully installed in the HST. The astronauts closed out the HST equipment bay doors and stowed the HSP and started upgrading HST's onboard computer by bolting on an electronics package containing additional computer memory and a co-processor. The computer system was then reactivated and passed it's aliveness and functional tests. The EVA was 100% successful and lasted for 6hr and 50 min. It will be six to nine weeks before optical alignments can confirm that HST is completely repaired. Bowersox performed two orbital manueuvers and boosted HST from a 321x317nm orbit to a 321.7nm x 320.9nm circular orbit. COSTAR functional tests were also completed. 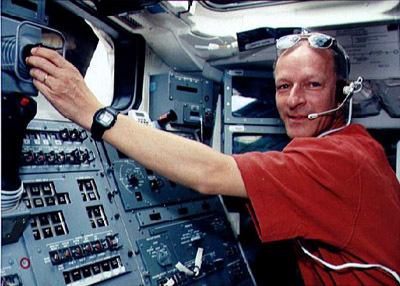 There was some concern about the health of the onboard HST DF-224 computer and recently installed memory and co-processor when a memory dump failed. After much analysis by a team at the GSFC, it was determined that the dump failure was due to noise on thecommunications link between the spacecraft and the ground. Day 8 EVA #5. 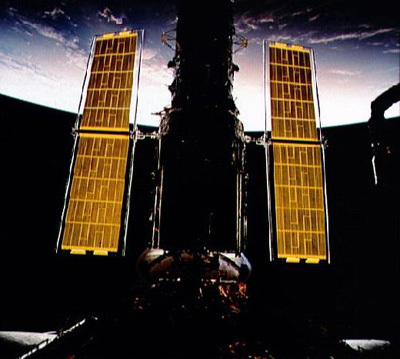 Musgrave's and Hoffman's first task was to replace the solar array drive electronics and they began the SADE operation while ground controllers initiated the first step in solar array deployment by commanding the Primary Drive Mechanism (PDM). The latches were unlocked but the arrays failed to rotate to the deploy position. The astronauts cranked the deployment mechanism by hand and deploy was successful. 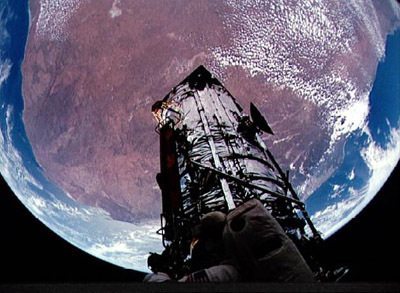 After the SADE was swapped out, the crew fitted an electrical connection box on the Goddard High Resolution Spectrograph. They then installed some covers on the magnetometers, fabricated onboard by Claude Nicollier and Bowersox. These covers will contain any debris caused by the older magnetometers which show some signs of UV decay. The EVA lasted 7hr and 21 min. bringing the total EVA time for this mission to 35hr and 28 min. Day 9 Concerns about one of HST's four onboard Data Interface Units (DIU's) delayed it's release. The DIU's are 35 lb electronic units that transfer data between HST's main computer, solar arrays and other critical systems. Controllers at the STOCC and mission control came up with a troubleshooting procedure to determine the extent of the problem. HST was transfered to internal power and disconnected from its power umbilical. Controllers then switched channels on the DIU from the A side to the B side and then back to the A side. They determined HST should be deployed. The drum brakes on the new Solar Array were applied to prevent them from vibrating during future observations. Claude Nicollier then took hold of the satellite with the robot arm. 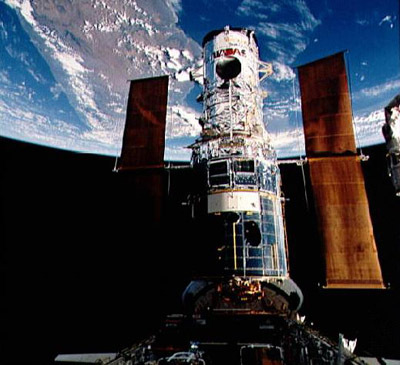 Hubble was switched back to internal power mode and the umbilical cord linking it to the Shuttle was disconnected. The satellite was then lifted and moved away from Endeavour. The telescope's apature door was then reopened (a 33 min procedure) and released. 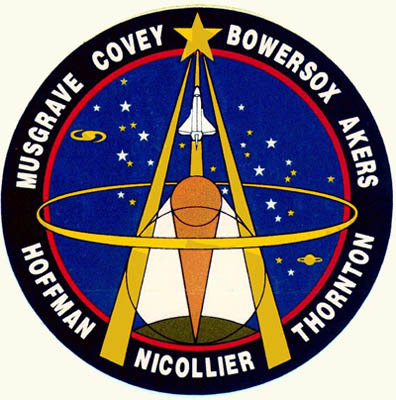 Covey and pilot Bowersox fired Endeavour's small maneuvering jets and moved the shuttle slowly away from HST. The next servicing vist to HST is scheduled for 1997.